I've been procrastinating about getting an S&W 29-2 or earlier preferably with a 4" barrel . I finally pulled the trigger and got one on GB . Then proceeded to order a Galco Silhouette holster from Midway ! Very nice! Love my 29s! I have it’s twin however I use a simply rugged sourdough. ...LEFT HAND. I had a Galco Silhouette for the 629 I owned before and I have Galco Silhouettes for my 1911 and S&W 19 . Now the question is how long I’ll hold out before getting a 29-2 with 6/6 1/2” and or 8 3/8” to match it . Nice gift! Love the 1890. One evening, my dad and I were out to our buddy's old timey gun shop (that I still frequent) shooting the bull. My dad asked me, "If you could have any handgun you wanted, what would you get?" When I told him, my dad looked at our old buddy and said, "Order it." I was blown away. We didn't have a lot of money. That was a big deal. 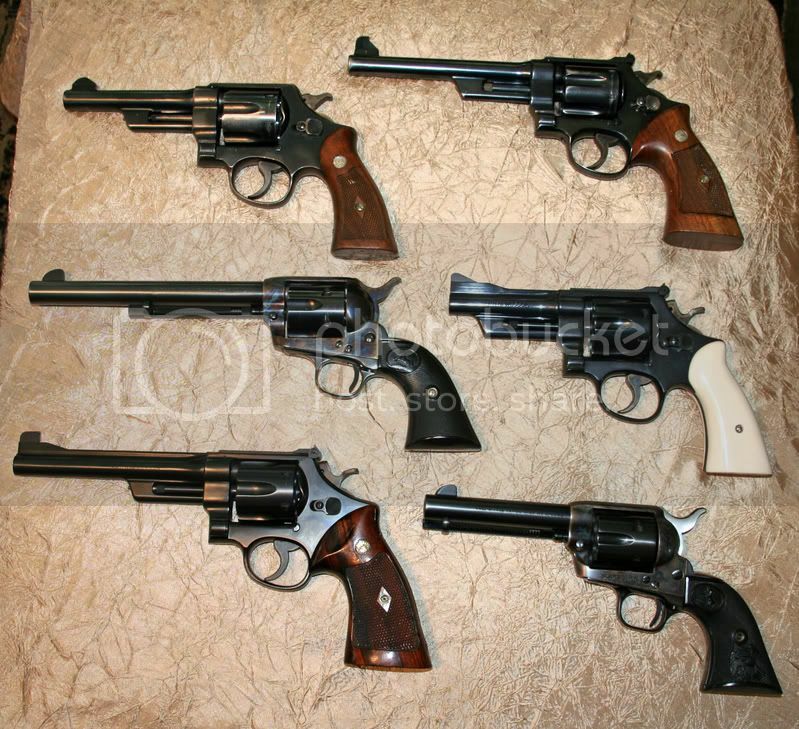 My dad's only handguns were a Colt Frontier Scout and a 41 mag Ruger Blackhawk. Funny you should mention the Colt Scout . My same grandfather ordered a Colt Scout Buntline Special right after I was born in 1961 and received it in early 1962 . I still have that gun as well along with the box papers original grips and a set of walnut grips he carved himself . That 4" barrel makes for one nicely proportioned revolver. Very good! I had a 8 3/8 too big. Then a 6 or 6 1/2 better but.... I traded that for a 4 inch and call me Goldilocks cause it is JUST Right! For me, your mileage may vary. 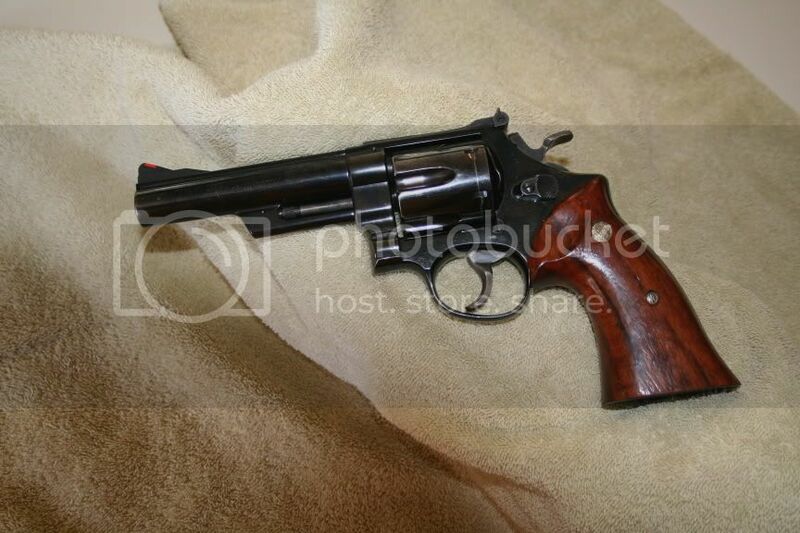 The 629 I used to own was a 4” and my S&W model 19-3 is a 4” and of course the 19-3 is pinned and recessed as well . I know that d probably be better off with 66’s and 629’s because I’ll carry these some , but the blues guns are calling me again . I have a 62 Scout myself. A convertible with the box, etc. I always liked the little things. Remember shooting my dads as a kid. I know I have a problem BUT usually when I get intrested in something I want one of each hence the reason I was up to a hundred or so Marlins at one point . Can’t very well do that with Parker shotguns but S&W 29-2’s In 4” 6 1/2” and 8 3/8” are somewhat attainable . I’d like a 2 1/2” 19-3 also . I was wrong it’s a 29-1 https://www.gunbroker.com/item/806534022 So you think the grips on the 29-2 I just purchased are factory ? I didn’t think they were . Love S&W revolvers, and especially N frames! But I've never warmed up to the .44 Magnum caliber. WHen I had my 29 and 629 I loaded them down to .44 Special levels. I have a 25-2 in .45 Colt, and a .38/44 Outdoorsman Target in .38 Special. I love these two guns, and the really pleasant calibers they're chambered in! That's a beauty! Those may indeed be factory grips, but not sure if they're factory for that gun. Pull them off and look for the serial number stamped inside the grip panels. That will tell if they're factory or if they've always been with that gun or another. Absolutely! Your grips are fine....The factory recognized the need for smooth grips as some guys said the checkering would bruise their hands. It hard to tell on the later 'Smiths as to originality as the writing and stamping stopped sometime in the late fifties/early sixties...going out of my head here.....Smith & Wesson also sold grips as an accessory......so......all in a nut shell, on guns made after the war, it's not imperative that the exact original grips are on the gun, but correct for that model and era. It would take a book to explain them all and no one can remember all of it....I got books down in the dungeon for when I'm spending big bucks. Nothing personal! The 29-1 you guys have on Gunbroker is going to be a hard sale at 3G's. It's the later 29-1 with the wrong grips.....maybe 12-15 as is. My Mini Mountain Gun... 625 45acp. My 5" model 29-2. I have the original cokes for it stashed. I didn’t know they made a 5” that early ! So in a 29-2 you could get 4 , 5 , 6 , 6 1/2 and 8 3/8” . 2 1/2” or 3” came later as did the silhouette 10 1/2” ? My just now pics don’t do it justice . nice shooter, I have 3 left... 6 inch nickel, 6.5 inch nickel and 3 inch nickel. Jay......I've known that you wanted a 4" N-frame so bad you would steal one if the chance ever came. That's why I buried this 4" 1950 Target under a ton of stone while you were here. Ha! Had a 4" Mod 24, traded it to a friend. A 6 1/2" shoots much better. Or a 6" Mod 28 is a great piece. I love N frames. Currently have a 6 inch nickel Model 57 no dash that is my favorite handgun of all time and a blue 6 inch 29-2 that was given to me when a friend passed on. Neither will ever go anywhere. Ok. So I got on Google Earth and found the big pile of stone. Now I just gotta sneak down there.......find a backhoe.........and dig that puppy up! Is it just me, or does anyone else not see sixguns' images? All I see is a blue box with "Image not found or was removed" inside the box? 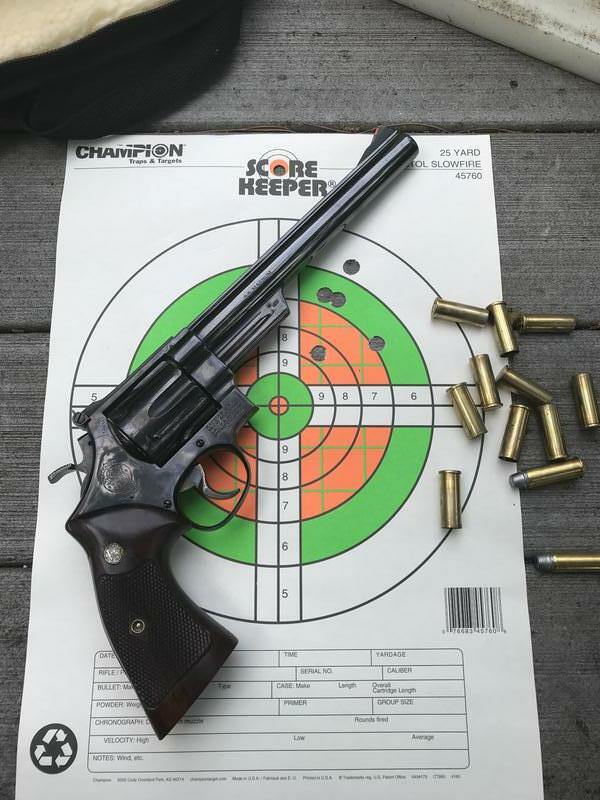 I don't have many long barreled revolvers but I really enjoy shooting this Model 29 five screw. Target was 25 yds offhand when I was having one of my better days. It was given to me by an uncle along with the mahogany case and tools. They all used to be in your town Old Savage! Bah humbug ... I prefer the L frame in 6". Nice old Smith's though. Bill, time to bring them back.